Greg is a composer and multi-instrumentalist who works in theatre, film, multi-media and band projects. Credits include composing for the National Theatre, having two songs featured on Shane Meadows film ‘Le Donk & Scor-Zay-Zee’ (Warp Films) and working for the British Library as an ethnomusicologist. This led him to travel to South Africa. 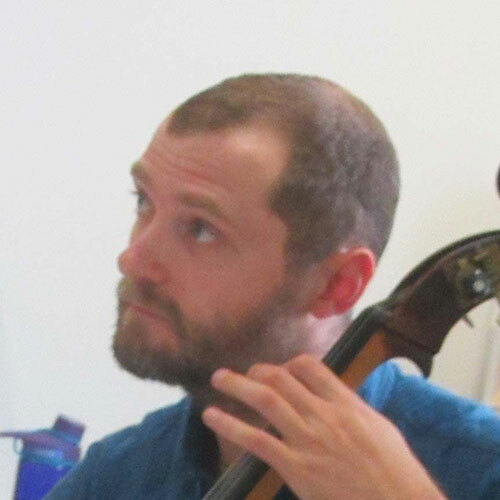 He is a member of acclaimed silent film accompaniment band Minima and electro-minimalist ensemble Piano Interrupted (Denovali Records) and has toured with Theatre Hullabaloo in their children’s production of Luna as well as other theatre & production companies. Greg worked with Japanese band Illion, a project formed by Radwimps frontman Yojiro Noda which performed at The Shepherds Bush Empire in 2013. Greg has worked with FRONTLINEdance since 2008.training as a professional dancer and dance for special educational needs gaining a distinction in this area. Rachael also holds a post graduate certificate in ‘dance artist in education’ and has taken part in a Dance for Parkinson training course created by Dance Umbrella and lead by Marc Morris Dance (USA).